This is an engaging read with quirky, likable characters with whom tweens will identify. A good purchase for any collection serving middle schoolers. Moody tweens will identify with prickly Sara. Purchase where the author's previous books are popular and for middle school collections in need of fiction featuring realistic family drama. 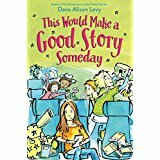 A must-have middle grade family story with contemporary sensibilities.